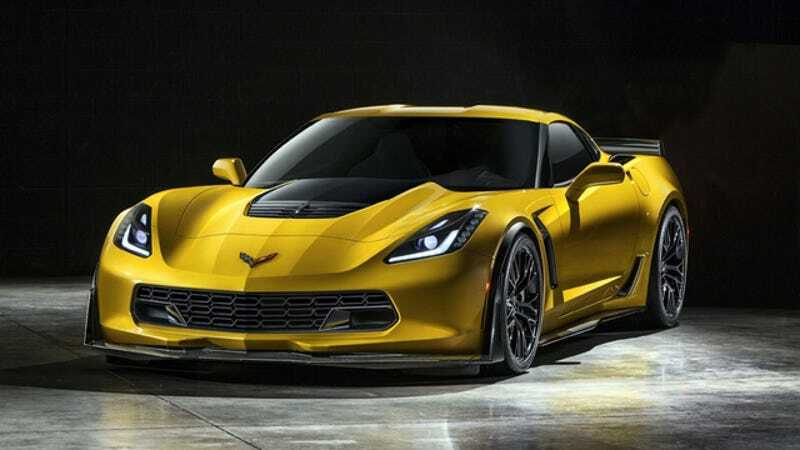 The 2015 Chevrolet Corvette Z06 will be officially upon us in a few hours, but as embargoes begin to crack like so many leaks in a dam, more information is flooding out. This time we've got more power numbers and a whole bunch more details. Numbers like 620 HP, 635 lb-ft, and 8 gears, if Hot Rod magazine is to be believed. They apparently gave up the goat, before quickly pulling it down, according to C7StingrayForum.com. The numbers are pretty much bang-on with what we heard earlier. In addition to a seven-speed manual transmission, the Z06 will actually be offering an eight-speed automatic, as well, in the form of the 8L90E. Yes, an automatic. With a torque converter. That probably sounds absolutely crazy to all the Corvette traditionalists out there. Get used to it, traditionalists, because this is the future, and the future is about speed. And in the future, machines will always be faster than you. The wheel and tire sizes are pulled straight from the last-generation ZR1, and since that car was never lacking in the rubber department, I doubt that will be a problem. Carbon fiber will likely abound as well, though so far the only confirmation we have is that the torque tube will be composed of the woven black stuff. And the final detail to emerge (so far), is that three different trim-levels will be offered on the Z06 with varying aerodynamic goodies, with the top level being referred to as the Z07. Everything that comes out keeps getting better and better. We'll update you when we hear more.